* The TransWilts train service was WITHDRAWN in December, 2006 and there are now just two trains a day running between Westbury and Swindon. This has extended the journey time by public transport from Salisbury to Chippenham from 55 minutes to between 80 and 110 minutes, and has extended the direct journey time by public transport from Trowbridge (County Town) to Swindon (largest urban area) from 35 minutes (train) to 95 minutes ("express" bus). The town of Melksham (population 24,000) now just has two trains each way daily - Southbound from Swindon at 06:18 and 18:45,and Northbound from Westbury at 07:00 and 19:35. * Current (2008) train services were specified by the Strategic Rail Authority in in 2005, based on a 2004 report that relied on statistics from 2003 and 2002. An assumption was made of a growth of less that 1%, but according to the rail regulator, traffic grew from 2002 at a compound rate of 35% per annum, and the only other official (different) measures - from First and Wiltshire County Council - both reported growth rates in excess of 10%. * When the through Swindon - Salisbury trains were withdrawn in December 2006, a service that had been running with just a few passengers in 2002 was popular and well used. When I was able to use the train regularly to connect on to Taunton or London, I usually found that my caraige on the TransWilts was BUSIER than my carriage on the main line service I changed into! 1. Bring the attention of the travelling public, and local and national politicians, to the threat to the service and the need to provide appropriate tarnsport between the towns of Swindon, Chippenham, Melksham, Trowbridge, Westbury, Frome, Warminster and Salisbury. 2. To establish who the key decision makers were / are in this process, and to have them take a further, carefully considered look at the provision of an appropriate service, based on local inputs and requirements and future traffic needs as well as the financial and operational factors. 3. To encourage the permanent provision of that appropriate service, and to fully support the marketing and publicity of that service when achieved. 1. The TransWilts service has been brought to a wider audience, including the decision makers. 2. The key decision makers have been identified (Department for Transport, First Great Western, Wiltshire County Council are the three major ones) and they have been lobbied at consultations and other times. Steadily more serious consideration has been given to providing an appropriate service. For the December 2007 timetable, First are providing an additional (Southbound) service on Sunday. It may be just one service above the minimum contractual obligation, but the longest of journeys starts with a single step. Also for this December, significant work was done with regards to the return of a three hourly service, down to some quite detailed discussions and an operational proposal. Regrettably, this was rejected in late May in favour of using the carriage earmarked for the service to provide extra Salisbury - Southampton trains running 12 minutes ahead of the new South West Trains service. "A very minor improvement for Hampshire has been placed ahead of a major restored service for Wiltshire". We residents of Wiltshire are furious. The newer trains are not being used to operate other services in the FGW area - they're being sent elsewhere in the country! * Major timetable changes from Westbury through Bristol to Cardiff and Gloucester. Also effecting other services around the Bristol area and cross Bristol connecions. * The additional peak hour Bristol to London service which was routed via Bristol Parkway to relieve overcrowding there will no longer serve Parkway. * Buffet cars will be withdrawn from London to Bristol trains and other shorter distance "125" runs. We understand that some West Country runs, including at least one as far as Plymouth, will also be included in the roster of these trains. * The more frequent service from Bristol Temple Meads to Avonmouth / Severn Beach, for which the Council has provided money, will NOT be operated. * Proposed Additional services to Frome, filling current long gaps, will NOT be provided. * TransWilts trains at 07:40, 10:30 and 13:30 from Salisbury to Swindon, returning at 09:00, 12:00 and 15:00 from Swindon will NOT be provided. Cut back to just 2 trains a day each way last December. New service was intended to provide a peak commuter service to / from Swindon (source - DfT, direct phone conversation) but in practise has been timed outside peak travel time. 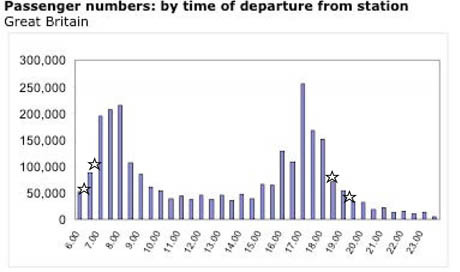 Bar chart shows journey start times, stars show the times "TransWilts" trains start. New service started with a truly dreadful reliability record, with remaining weekday services being replace by buses on over 40% of occacions (statistic for the first weeks of January). Although the reliability has improved (only 2 cancellations in the last week as I write this - that's 10%) the new timings have proven inappropriate for most travellers and the reliability issue has forced much of the remaining traffic away from the service. I have figures of between 110000 and 120000 figures for journeys made on the line for a recent full year (figures from FGW). I estimate journeys in the current year will be between 5000 and 10000. That's a cut from an AVERAGE of 33 passengers per train to an average of less that 10, and indicates a clear failure of the new timetable and / or its marketing in its goal of retaining the best used peak services. Saturday and services are also proving to be inappropriate / lightly loaded. The 09:02 Westbury to Swindon timing is good, but the train at 17:50 that people used to return from a day out on (typical loading was well above the average figures) has gone so people can't get back home to West Wiltshire. The Sunday service of 2 Northbound trains and none Southbound is also quiet; the two trains are mid and late evening. The first one loads at about the new average; the second one is near-empty. Once again, poor timing and lack of round trip options have resulted in a failure to - so far - capture the market for which the trains were intended. 2. On possible improvements at current level. Services 7 days a week from Westbury at 07:45 and 16:45, returning from Swindon at 08:45 and 17:45 would NOT need any government permission as they fall within the SLC2 specification apart from the 08:45 and 17:45 from Swidnon on Sundays! They are also within the spirit of the specification. c) A service every 2 hours (given appropriate timings / stock) between Frome, West Wilts and Swindon. and I commend these options to the planners / railwaymen / polititians. ii) Jacobs 2004 (even on pessimistic growth figures of 0.8% when over 10 time that was achieved) recommended the clockwork day time service as cost effecive, using the same train as provided the PEAK service. iii) Additional trains would also cause an increase in usage of the current 2 round trips (at their new timing) with passengers looking to commute for longer and shorter days. iv) We have identified 12 key traffic flows that this line used to cater for and the new services recommended meet all these flows. There used to be a significant adhoc longer distance traffic too. v) West Wilts, Mendip, Chippenham and Swindon are all set for major growth over the next 20 years. The A350 road that parallels the railway will not be able to cope with the growth, and town centre access and parking in Trowbridge, Melksham, Chippenham and Swindon (4 of the 5 largest towns in the county) is problematic in every case. vii) Usage levels up to December 2006 were continuing to grow and surveys indicated that a continuation of that growth level for the next 10 years would have been probable. viii) Swindon is a top commuter destination (as well as Bristol and Bath) from West Wiltshire, and that will continue to grow. The current service is essentially a commutert train from West Wiltshire to Gloucester / Cheltenham which is NOT a major commuter flow. a) What about a service that's concentrated in the peak and allows the stock to be serviced during the day? Answer - in principle, yes, using the existing 2 services at EXISTING times with at least 3 extra round trips a day, running an hour before and an hour after (evening) and an hour after (morning). On this scenario, the current morning service from Westbury could be retime at 06:30, new service at 07:30.
b) It is noted that the December '07 timetable may include a dramatic reduction of services to Dilton Marsh, and some reduction to Warminster. However, we are also informed of a major tiemtable revision in the Bristol - Westbury corridor and this may be corrected. It may be worth exploring turning some of the Swindon services at Warminster. I await input from First who are writing to me shorty with regard to what is currently suggested from this coming December - we already know of plans for certain changes (in principle) between Westbury and Bristol. Wiltshire County Council, the Department for Transport and First Great Western all need to work on this from a financial and rail angle, and every attempt is being made to bring the parties together. In spite of the recent rebuttal by the Department for Transport of the petition for an appropriate service (which requoted the conclusions form old statics that have proven with time to be incorrect, blamed First for the reliability issue, and rejected a request that we had NOT made for a return to the old service), there ARE encouraging noises behind the scenes. In principle, DfT want to find an alternative to the current service that is clearly NOT working as they intended. Contrary to the report (above) from the PM's office, and other things said in the public arena, I have been encouraged by the positive and realistic approach by civil servants and by some political whispers. Wiltshire County Council have the rail route as one of their strategic ones under the Local Transport Plan, but it would be helpful (perhaps pivotal) if they took an element of day-to-day ownership of the issue. First have indicated a willingness to run the service is provided and have been helpful with information and helping to evaluate options. Some historic elements (such as signage, bus connections, and the truely dreadful current timings introduced in spite of consultation inputs that told them that they would not work) need to be overcome. We also need to look wider. Community Rail has been mentioned and is worth investigating (I understand things may be under way). Inclusion within Severnside Partnership (extending it to Westbury, Frome, Swindon, Gloucester). Ensuring the Somerset, Swindon and other appropriate groups / authorities are involved too. West Wilts Rail User group, Melksham Rail Development Group, "Save the Train" and many others in full support. Local MPs in full support (and candidates for new Chippenham seat too), and most local councillors. a) Suggestion of a "Hustings" meeting in the next few weeks before the local elections to give the politicians a chance to air their views in public. b) Support officers groups - positive suggestions / inputs from service users and all parties, in spite of some of the public rebuffs. c) Publicity events such as an August Sunday special - say Swindon to Weymouth as a day trip. e) Co-ordination / information exchange via web sites such as www.savethetrain.org.uk, and working in / with Travel Watch South West and others. Prepared by Graham Ellis, 4th April 2007. On 10th December 2006, First Great Western acting under a franchise issued by the Department for Transport SLASHED train services on the TransWilts line (Swindon to Westbury and Southampton via Melksham) by over 60%, with the few remaining trains timed for operational conventience and not for passengers. Melksham, population 24,000 and forecast to grow to around 32,000 by 2026 is left without a single train between 07:17 in the morning until 19:08 at night ... and this on a service which has shown significant growth in the past 5 years - ticket sales at Melksham up from 3000 to 27000 per annum, 8% compound rise in journeys yearly according to county council surveys. And what basis was used for the cuts? Figures that are now 4 years out of date, a growth forecast of between 0.8% and 1.7%, and an operator who runs a near monopoly on public transport in the region, and who knows that passengers wil be forced onto his other longer, more expensive, less convenient and slower services. This isn't just a Melksham issue! Swindon to Trowbridge travellers are just as inconveninced, now being offered services at only 06:19 and 18:43. Chippenham to Salisbury becomes a nightmare by public transport. Frome to Swindon commuters face an extra 100 minutes on their day. In fact - for every Melksham traveller, there are three more who have been using the service through Melksham for these other journeys. This site has been dedicated to a fight to "Save the train" from its inception in August 2005, which was just after a quiet "consultation" that none of us had heard about. We've been told 'too late' a lot of time. We've been told a lot of other things too. First managers have admitted that the new timings are dreadful and don't answer any of the inputs / suggestions we made at the consultation - quite the reverse but - and here's some light - they ARE looking at what they can do to improve the situation from the next timetable revision. And there is political interest and some activity behind the scenes. Did you know - the largest towns in Wiltshire are Swindon, Salisbury, Chippenham, Trowbridge and Melksham, in that order. Now where does / did the TransWilts serve?